Banquet Halls in and Around Sarjapur Road Bangalore That Are Absolute Stunners! Most important of all wedding planning processes, selecting a venue can be fun for some and stressful for some. Whether you require a wedding hotel just for your pre-wedding function or both pre-wedding and wedding reception you should choose your wedding location as soon as possible since many popular wedding venues get booked months in advance. A wedding venue comprises the biggest chunk of your wedding budget; therefore it’s advisable that you do your research before locking down on one. Bangalore has hundreds of beautiful places to get married, but narrowing them down to find the most idyllic spot for your wedding reception or ceremony isn't easy. If you’re specifically looking for banquet halls in and around Sarjapur Road, here are our top 5 wedding locations and event spaces. Offering multiple banquet halls in Marathahalli, Park Plaza is a chic and classy wedding venue you can find in Bangalore. Perfect for a medium-sized or large gathering celebration, you have a choice of 7 banqueting spaces and a terrace venue to choose from for all your pre-wedding and wedding related festivities. Excellent catering services and alcohol arrangements are managed by their in-house staff. The venue allows you to book your own decorator to spruce up the venue and DJ to add a zest of entertainment to your celebration. This wedding venue in Bangalore is sure to steal your heart away. Offering one of the most sought after banquet halls in Bellandur, Temple Tree Leisure is an ideal wedding destination for grand and elegant celebration. Their stylish banquet hall is perfect for sangeet and mehndi functions. Should you need a large space to host a grand wedding, their banquet hall is clubbed with the courtyard and lawn area to give you a spacious indoor and outdoor venue, which can comfortably accommodate up to 1800 guests. Decoration services are provided in-house. The venue allows you to make your own catering, DJ and alcohol arrangements. If you’re looking for aesthetically decorated banquet halls in Sarjapur Road, look no further than Octave Hotel & Spa. Offering stylishly designed banqueting spaces; this wedding hotel in Bangalore provides small as well as medium-size capacity areas to host your pre-wedding and wedding functions. You can either avail their in-house catering services or make your own arrangements. The venue also allows outside decorator, DJ and liquor on the premises. For couples looking for a smaller banquet hall in Bellandur to host their pre-wedding function or are having an intimate wedding celebration, Citrus Hotel Bellandur is your perfect match. While their banquet hall is of a smaller capacity, you can book their terrace venue should you have a slightly expansive guest list. The venue provides scrumptious catering services and a variety of alcohol arrangements in-house. You can book your own decorator and DJ to liven up the ambiance for your festivities. This luxurious wedding hotel in Bangalore offers the most extravagant banquet halls in Sarjapur Road. Right from their exterior to interior infrastructure your guests are sure to be spellbound. Their banquet hall offers a great space to host intimate to medium-sized functions, while their terrace venue is great to host pre-wedding functions, such as mehndi and sangeet under a starry sky. As a full-service wedding hotel, Berry’s offers all wedding services, including catering, decoration and alcohol facilities in-house. The venue allows you to book your own DJ. Just in case you’re looking for an outdoor venue in Bangalore, here is an excellent choice. Magnum Arena one of the most capacious wedding lawns in Sarjapur Road offers over 6 acres of plush green event space perfect to host a grand outdoor wedding. The venue is not just all about splendour and grandeur space, it is also one step ahead in providing professionally exceptional services and impeccable arrangements. The venue allows you to book your own caterer, decorator and DJ. Outside alcohol too is permitted on the premises. 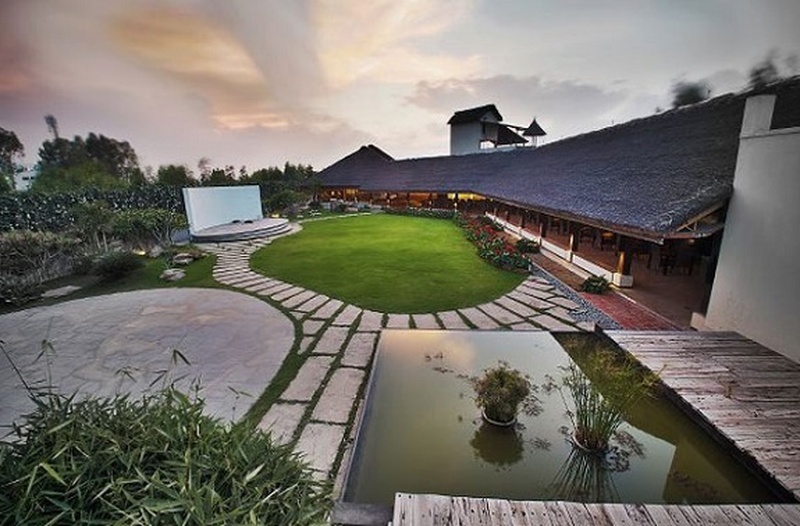 If you’re looking for a unique and unconventional wedding venue nestled in a quiet lane off Sarjapur Road, The Courtyard House is perfect for hosting private events. Surrounded by a lawn and open space, this venue is ideal for couples who wish to host a serene outdoor mehndi, sangeet and/or wedding reception. The beautiful architecture and greenery it has to offer makes it the best location for your pre-wedding shoot as well. The Courtyard House allows outside decorators, caterers, DJ and permits you to make your own alcohol arrangements too. Check out more wedding hotels and marriage banquet halls in and around Sarjapur Road here.